In Aqueduct, HTTP requests and responses are instances of Requests and Responses. For each HTTP request an application receives, an instance of Request is created. A Response must be created for each request. Responses are created by controller objects. This guide discusses the behavior of request and response objects. A Request is created for each HTTP request to your application. A Request stores everything about the HTTP request and has some additional behavior that makes reading from them easier. You handle requests by writing code in a controller object or closures. A Request also has two built-in attachments, authorization and path. authorization contains authorization information from an Authorizer and path has request path information from a Router. Headers are encoded according to dart:io.HttpHeaders.add. For body encoding behavior, see the following sections. Request and Response objects have behavior for handling the HTTP body. You decode the contents of a Request body into Dart objects that are used in your code. You provide a Dart object to a Response and it is automatically encoded according to the content-type of the response. Every Request has a body property. This object decodes the bytes from the request body into Dart objects. The behavior for decoding is determined by the content-type header of the request (see the section on CodecRegistry later in this guide). When you decode a body, you can specify the Dart object type you expect it to be. If the decoded body object is not the expected type, an exception that sends a 400 Bad Request error is thrown. Once a request's body has been decoded, it can be accessed through a synchronous as method. This method also takes a type argument to enforce the type of the decoded body object. You don't need to provide a type argument to as or decode if the type can be inferred. For example, object.read(await request.body.decode()) will infer the type of the decoded body as a Map<String, dynamic> without having to provide type parameters. If a body cannot be decoded according to its content-type (the data is malformed), an error is thrown that sends the appropriate error response to the client. For more request body behavior, see the API reference for RequestBody, the section on body binding for ResourceControllers and a later section in this guide on Serializable. The size of a request body is limited to 10MB by default and can be changed by setting the value of RequestBody.maxSize during application initialization. An HTTP response often contains a body. For example, the body in response to GET /users/1 might be JSON object that represents a user. To ensure the client understands that the body is a JSON object, it includes the header Content-Type: application/json; charset=utf-8. // ContentType.json is the default, setting it may be omitted. Body objects are encoded according to their content-type. In the above, map is first encoded as a JSON string and then to a list of UTF8 bytes. A ContentType is made up of three components: a primary type, a subtype and an optional character set. The primary and subtype determine the first conversion step and the charset determines the next. Each step is performed by an instance of Codec (from dart:convert). For example, the content type application/json selects JsonCodec, while charset utf-8 selects Utf8Codec. These two codecs are run in succession to convert the Map to a list of bytes. The codec is selected by your application's CodecRegistry; this is covered in later section. The body object must be valid for the selected codec. 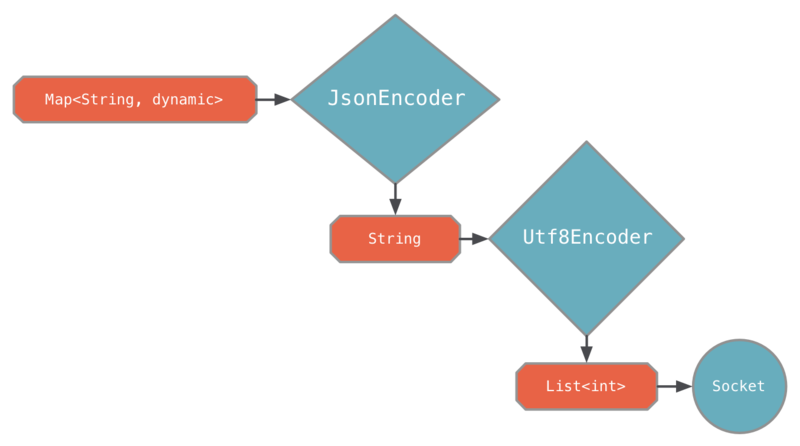 In the above example, a Map<String, dynamic> can be encoded by a JsonCodec. But if the body object cannot be encoded, a 500 Server Error response is sent. A valid input for one Codec may not be valid for another; it is up to you to ensure that the body object is valid for the contentType of the response. And an image body object needs no conversion at all, since it is already a list of bytes. If there is no registered codec for a content-type, the body object must be a byte array (List<int> where each value is between 0-255). See a later section for more details on content type to codec mappings. Also, see the documentation for CodecRegistry for details on built-in codecs and adding codecs. When a body object is a Stream<T>, the response will not be sent until the stream is closed. For finite streams - like those from opened filed - this happens as soon as the entire file is read. For streams that you construct yourself, you must close the stream some time after the response has been returned. In the above sections, we glossed over how a codec gets selected when preparing the response body. The common case of ManagedObject<T> body objects that are sent as UTF8 encoded JSON 'just works' and is suitable for most applications. 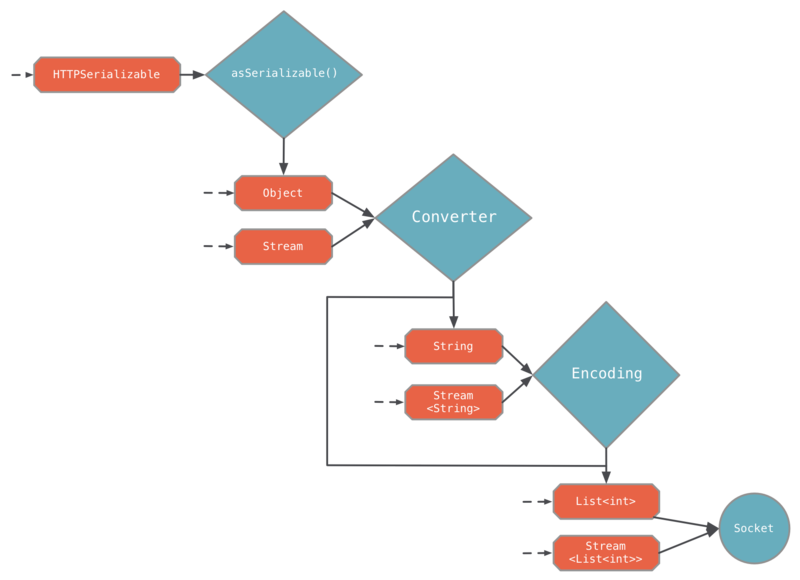 When serving assets for a web application or different data formats like XML, it becomes important to understand how Aqueduct's codec registry works. CodecRegistry contains mappings from content types to Codecs. These codecs encode response bodies and decode request bodies. There are three built-in codecs for application/json, application/x-www-form-urlencoded and text/*. When a response is being sent, the repository is searched for an entry that exactly matches the primary and subtype of the Response.contentType. If an entry exists, the associated Codec starts the conversion. For example, if the content type is application/json; charset=utf-8, the built-in application/json codec encodes the body object. Codecs must be added in your ApplicationChannel.prepare method. The codec must implement Codec from dart:convert. In the above example, when a response's content type is text/html, the HTMLCodec will encode the body object. This codec takes precedence over text/* because it is more specific. When selecting a codec for a response body, the ContentType.charset doesn't impact which codec is selected. If a response's content-type has a charset, then a charset encoder like UTF8 will be applied as a last encoding step. For example, a response with content-type application/json; charset=utf-8 will encode the body object as a JSON string, which is then encoded as a list of UTF8 bytes. It is required that a response body's eventually encoded type is a list of bytes, so it follows that a codec that produces a string must have a charset. If there is no codec in the repository for the content type of a Response, the body object must be a List<int> or Stream<List<int>>. If you find yourself converting data prior to setting it as a body object, it may make sense to add your own codec to CodecRegistry. If no charset is specified when registering a codec, no charset decoding occurs on a request body if one doesn't exist. Content-types that are decoded from a String should not use a default charset because the repository would always attempt to decode the body as a string first. Body objects may be compressed with gzip if the HTTP client allows it and the CodecRegistry has been configured to compress the content type of the response. The three built-in codecs - application/json, application/x-www-form-urlencoded and text/* - are all configured to allow compression. Compression occurs as the last step of conversion and only if the HTTP client sends the Accept-Encoding: gzip header. Most request and response bodies are JSON objects and lists of objects. In Dart, JSON objects are maps. A Serializable object can be read from a map and converted back into a map. You subclass Serializable to assign keys from a map to properties of a your subclass, and to write its properties back to a map. This allows static types you declare in your application to represent expected request and response bodies. Aqueduct's ORM type ManagedObject is a Serializable, for example. The body object of a response can be a Serializable. Before the response is sent, asMap() is called before the body object is encoded into JSON (or some other transmission format). A response body object can also be a list of Serializable objects. The flow of a body object is shown in the following diagram. Each orange item is an allowed body object type and shows the steps it will go through when being encoded to the HTTP response body. For example, a Serializable goes through three steps, whereas a List<int> goes through zero steps and is added as-is to the HTTP response. Both serializable and a list of serializable can be bound to a operation method parameter in a ResourceController. In the above: if the body contains 'id', the value is discarded immediately; if the body contains 'password', a 400 status code exception is thrown; and if the body doesn't contain all of name, height and weight, a 400 status code exception is thrown. When binding a list of serializables, filters are applied to each element of the list. A Serializable object must implement a readFromMap() and asMap(). readFromMap is invoked by read, after all filters have been applied. See the section on how Serializable types work with OpenAPI documentation generation here. Add package:mime to your pubspec.yaml as a dependency.